This post title should really be named A Whole Lot of This & That because I am about to catch you up on even more of October! We celebrated our cousins' birthday at the beginning of the month. It was originally supposed to be at the pumpkin patch but due to the weather they had to move it their house & it was SO cute! It was still so 'pumpkin' style & my kiddos loved painting pumpkins! Cooper finished his first set of golf lessons & did amazing! We got to drive him around on the golf cart every week . . .
And while he took lessons Millie Jo did flips in the grass. We spent time up at Paw-Paw the Great's house. 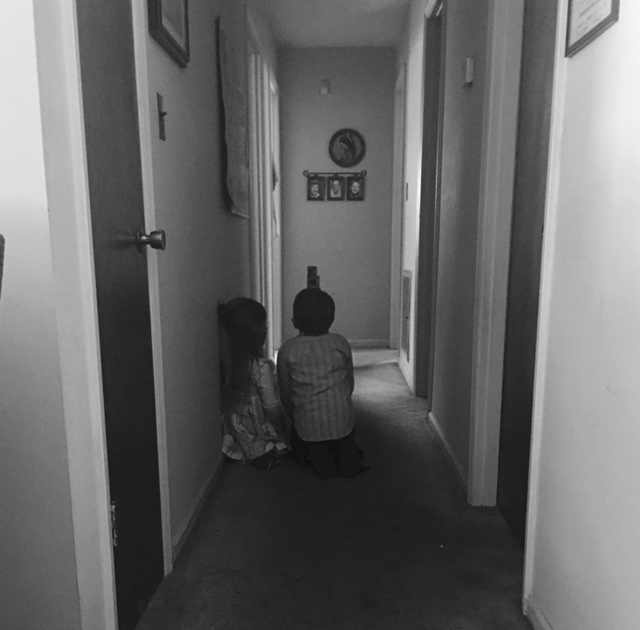 I sent it to my sister-in-love when I took it because I can only imagine that's what her & Dan looked like when they were little playing in that hallway :). Paw-Paw the Great used to be a photographer so every time we go see him he takes pictures! It's very rare that he is in any pictures so I always try to get him in at least one when we go see him! But on this day I got him in two. We are so blessed to have him! On October 14th this man & I celebrated 13 years together! to play golf with them. When we pulled up to the course he couldn't believe it. And y'all, he was the cutest thing. I could tell he was trying to impress me as if it was one of our first dates. You couldn't knock the smile off his face. He has asked me to go with him for years but I never have. Shame on me because it really was such a fun date & we laughed the entire time. Where in the world did my baby boy go!?! Thankfully he isn't too big for his mama yet ... as he's cuddled up next to me asleep as we speak! Some friends of ours live on a farm & they were nice enough to let us come check it out one day. Millie Jo LOVED their dogs. And if you follow me on snap chat [whitpegram] then you saw that we got all up close & personal with the animals ... especially the cows & donkeys! The last week of October was spirit week at Coop's school & he was all about dressing up everyday! Oh life with a big brother :). If you ever come to our house, chances are Coop will ask you ... 1,584 times ... to go outside & play football with him! Sort of like the book "If You Give a Mouse a Cookie" except it would be "If You Give Cooper a Football" :). I told you on Friday that Millie Jo loves to color. I mean ... LOVES it! And this is her favorite place to sit & do so! One night Millie Jo went to stay the night with Grammy & Pop so Coop & I had a Chinese date. Chinese + quality time = Two of his favorite things! We ended our night playing board games .... & yep, he was stomping me BUT I came back & won ;). And that covers our month of October! Between our vow renewal , Ruthie Belle's day & all of the other fun things we did it was such a sweet one. God sure has blessed me with these three & my sweet angel girl!